Indian Railways has proven its worth time and again as the world’s largest employer which ferries hundreds of millions of passengers across the country every year. Railways has seen many crucial changes in the last few years. These included changes of leadership plans for bullet trains, trials to increase the speed of existing trains, cleanliness initiatives being launched on stations and much more. 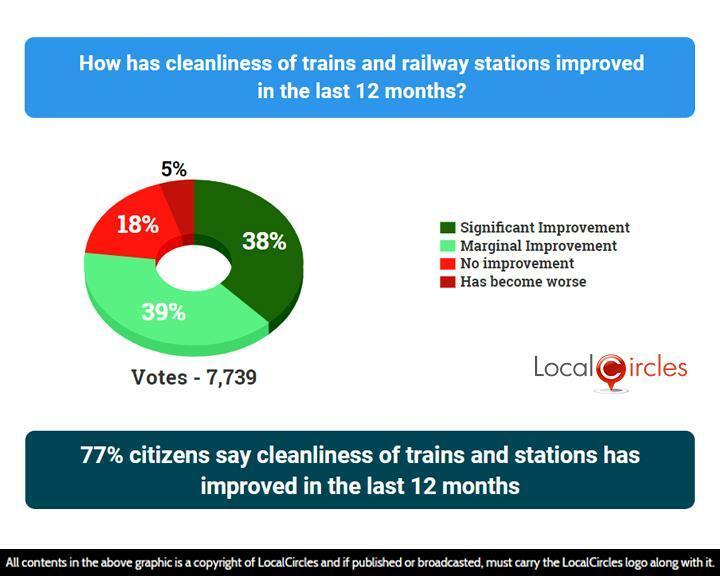 LocalCircles carried out a large survey to understand what citizens think about the state of Indian railways in the last 12 months. The results point out towards some important gaps in the system which needs to be plugged soon. Late arrivals and departures have been issues which have haunted Indian railways for decades now. Passengers have to wait for hours for the trains to arrive, especially in the winter months when fog causes havoc. 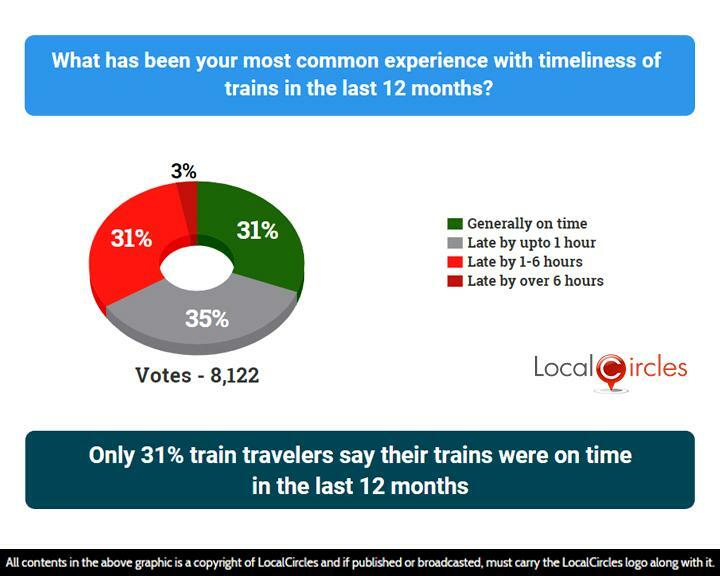 When asked what their most common experience with timeliness of trains in the last 12 months has been, 31% said trains were generally on time, 35% said trains were late by up to 1 hour, 31% said trains were late by 1-6 hours, and 3% said they were late by over 6 hours. Citizens have also reported that the timeliness reported by the Railways is not entirely correct and many times the departure/arrival time reported in enquiry systems on web/sms differs from that actual time of the train’s arrival or departure. Last year, the Comptroller and Auditor General of India (CAG), in a report declared that the food provided by IRCTC was not fit to be eaten and was unhygienic. After this IRCTC took various steps to ensure improvement, although not much was achieved. Fresh reports say that railways have pledged Rs. 250 crores to upgrade the pantry cars in trains and make the food served more hygienic. 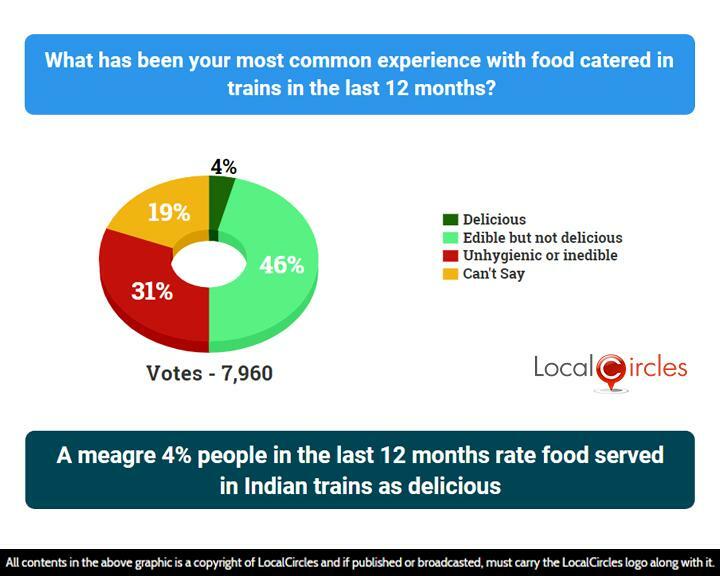 When it came to food catered in trains in the last 12 months, only 4% said it was delicious while 46% said it was edible but not delicious. 31% said it was unhygienic or inedible, while 19% were unsure. The Tatkal reservation category coupled with the Premium Tatkal category has taken the ticket pricing to a new high. Although this category is meant to help people in urgent and emergency situations get tickets, the high prices leave a hole in the passenger’s pockets. 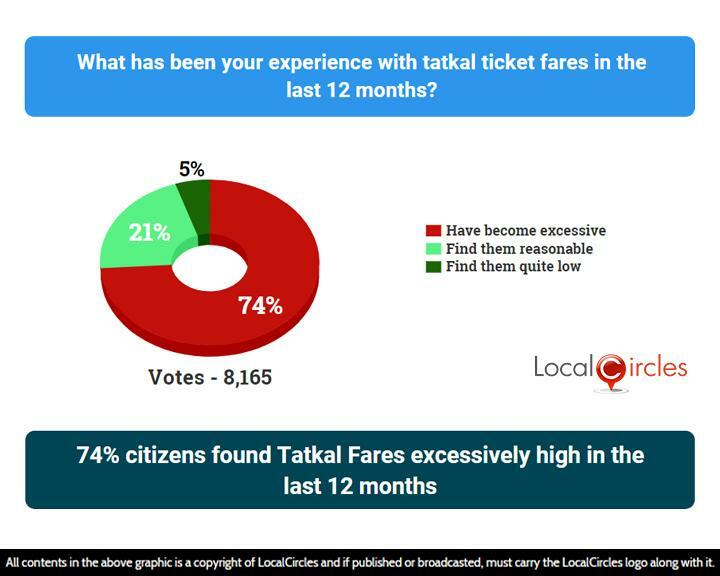 74% citizens in the next question said that tatkal ticket fares have become excessive while only 21% said they find the tatkal fares reasonable. 5% found them to be quite low. Flexi fares also led to the increase in the ticket prices. Last year, citizens through a LocalCircles survey had demanded that the flexi-fare scheme of the railways be discontinued. These findings were also submitted to the Railway Ministry for action in 2017 where Railways only recently committed to selectively eliminating flexi fares. The railway ticket cancellation charges have been a topic of discussion through out the last year and thousands of complaints have been received in the Railways circle about excessive cancellation charges. A large 80% in the next poll said that the railway ticket cancellation charges have become excessive while 15% said they were reasonable. 5% found them to be quite low. Earlier, a LocalCircles survey had revealed that citizens want some amount to be refunded when tickets booked under that Tatkal category are cancelled prior to 6 hours before train departure. Indian Railways has taken many steps to improve the safety and security of passengers and reduce accidents. Almost 3400 unmanned level crossings have been eliminated and the process of installing black box on trains to understand the reasons for accidents has also started. 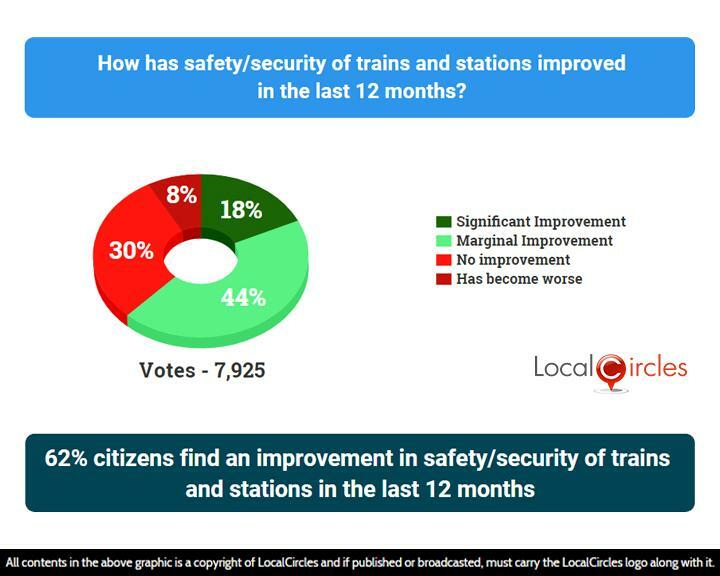 18% also thought that there has been a significant improvement in the railway safety and security in the last 12 months, while 44% said there has only been a marginal improvement. 30% found no improvement and 8% said situation had become worse. Railways recently renamed its cleaning staff as ‘housekeeping staff.’ There has been visible improvements in the level of cleanliness on stations and inside trains since the launch of the Swachh Bharat Mission, and it has made train travel a bit more enjoyable. Next question asked how the cleanliness of trains and railway stations has improved in the last 12 months. 38% said there has been a significant improvement, 39% said there has been a marginal improvement, 18% said no improvement was seen, while 5% found it to have become worse. The ministry also undertook an overhauling of the IRCTC website to make it more user friendly and also added many new features to it. Although some people have appreciated the changes, many have said that the new website is a little confusing and tough to use, especially for the senior citizens. Even after 2 months of the new site being operational, thousands of complaints are being received every month about the new IRCTC site. People are reporting struggling with finding their bookings to printing booked tickets and several other issues with the user interface. Some have even demanded reverting back to the old IRCTC site. The final question asked what their experience in has been the last few months with the new IRCTC website. 33% said it is better than the old website and 46% said it is worse than the old website. 21% said it was more or less the same as the old website. 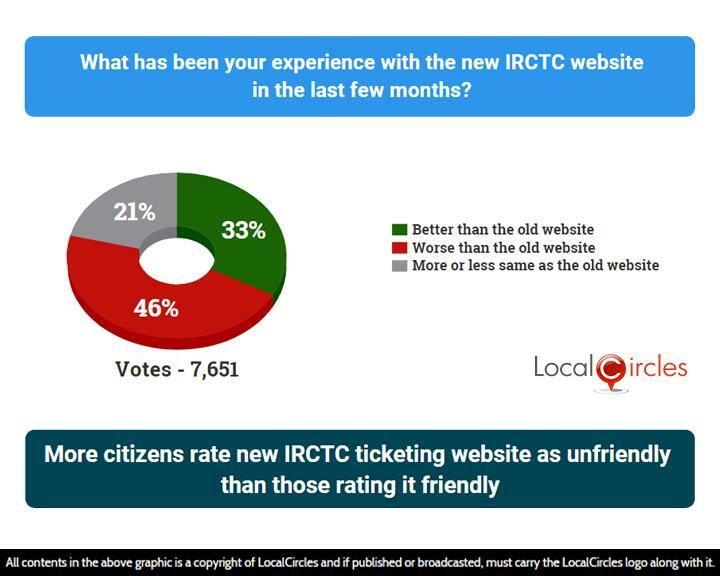 In various structured discussions on LocalCircles, citizens also said that the new IRCTC site still lacks a provision for onward booking, and if their IRCTC account becomes inactive due to wrong password, it becomes very tough to revive their wallet balance. Other issues identified with the next generation IRCTC site were debit/credit card payment options not working, senior citizens not being prioritized for lower berth and the refunds taking more time than what the site claims. This report points towards the fact that railway has made some improvements in the last 12 months but there is a lot that still needs to be done to bring Indian railways at the same level of some other countries. Citizens are very happy with the cleanliness initiatives of railways but are still unhappy with excessive tatkal and ticket cancellation charges. 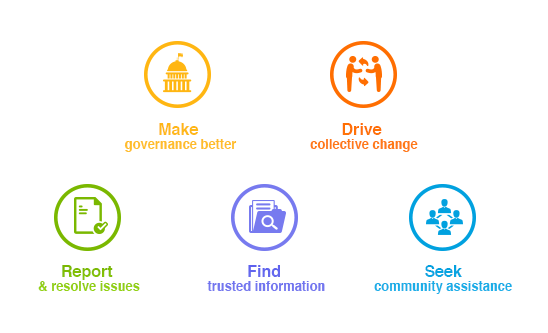 Over 55,000 responses were received from 27,000+ unique citizens located in 200 districts of India. Approximately 39% of the respondents were women while 61% were men. 48% of the participants were from Metro/Tier 1 cities, 30% from Tier 2 cities and 22% were from Tier 3 and rural locations.